This story is about a mystery involving the flag staff that once stood at Camp Howze, a sprawling World War II Army base at Gainesville. But first, I need to provide a little insight into the character of L.A. Wilke, manager of Gainesville’s chamber of commerce during the war. If Granddad ever had an argument, I never saw it. And I sure never argued with him. Not that he couldn’t get angry, but Granddad was a confident, decisive man. To use a favorite term of his, when he believed someone had stepped out of line, he usually “read them the Riot Act.” It was one-way communication, not an argument. He never lacked for an opinion and was not shy about expressing it. Finally, not to engage in stereotyping on the basis of national origin, but recall that his last name was Wilke. His grandfather came to Texas in 1850 from Germany. Now back to the mystery. With the war against Germany and Japan more than a year-and-a-half in the past, the federal government was busy in 1947 disposing of surplus property connected to the late horrendous global conflict. Everything from cavalry posts built during the Indian-fighting days to huge tracts of land to heavy equipment and plumbing fixtures were on the auction block as the U.S. ratcheted down its military might. And while the world was a much more peaceful place that distant winter, a degree of post-war ill will had arisen between the cities of Gainesville and Bonham. Both North Texas communities wanted that flag pole. Bonham intended to put it in front of its Works Progress Administration-built high school, while Gainesville sought the staff for use in some manner of war memorial. Hearing of the matter, Granddad strapped on his figurative helmet and joined the battle. “L.A. Wilke, manager of the chamber of commerce during the war years, said he had extracted a promise from successive camp commanders that Gainesville would be given the flagpole and the mural in the officer’s club,” the AP story reported. Knowing Granddad, I expect he got on the telephone as soon as he heard about it and called the Texas office of the WAA as well as someone in Bonham to assert Gainesville’s case. I imagine he also fired off letters to others in the government and perhaps appealed the matter to the Congressmen he knew. Of course, the speaker of the house was Sam Rayburn – a graduate of Bonham High School. Realizing that money talked and promises walked, Gainesville civic leaders planned to send a delegation to Bonham to offer to buy the flag from the school district. But J.B. Golden, Bonham’s school superintendent, had said no soap to Granddad’s successor on the Gainesville chamber, John S. Hardy. Annoyingly, the AP did not follow up on the flagpole story. That means the sale probably went through and Gainesville lost out on the handshake deal my Granddad had made. So where’s the historic flagpole today, assuming it still exists? 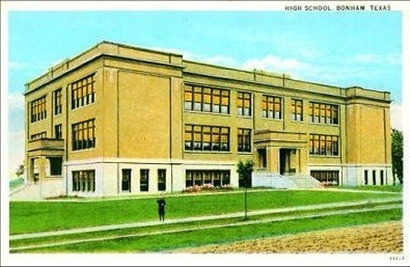 The two story, Depression-era Bonham high school building has long since been replaced. Did the old flagpole go to the new school? The Internet is silent on the fate of the tall relic. Even more haunting, from the perspective of historic preservation, is this question: What became of the mural in the officer’s club? What did it depict? Who painted it? Did someone save it? Is there at least a photograph of it? Six decades later, little remains of a huge facility northwest of Gainesville that played so important a part in the war effort. 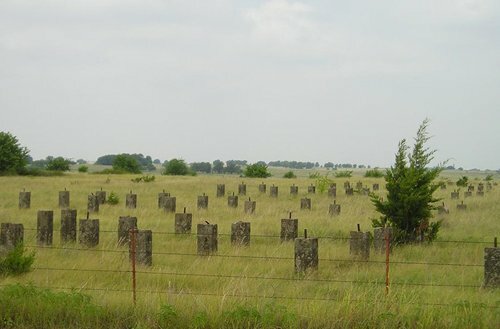 There’s a vast field of concrete foundation piers that look like tombstones and an old concrete water tower and that’s about it, except for a bronze statue of a GI placed by 103d Infantry Division veterans in 2006 at the state tourist information center across Interstate 35 from the site of the old camp. I’m sorry Granddad apparently lost his argument with Bonham and the federal bureaucracy over the fate of the Camp Howze flagpole, but I’m proud that he had the foresight so soon after the war to realize that today’s surplus property is tomorrow’s historical artifact.